Students at the College of William and Mary gathered in the Sunken Garden on one of Williamsburg’s first spring days to demand action on climate change. Activists from the Williamsburg Sunrise Movement Hub organized this protest as well as a student strike in solidarity with the U.S. Youth Climate Strike. This strike saw students from across the nation leaving their classes Friday, March 15 and converging together to urge political leaders to act on climate change. The student strike from classes was started by 16-year-old Greta Thunberg who began protesting every Friday in front of the Swedish parliament a year and half ago. Students at the College joined an estimated one million others from around the globe in skipping class. At the College, student leaders from the Sunrise Movement, the College’s chapter of the Young Democratic Socialists and the American Indian Student Association spoke about the necessity of addressing climate change. 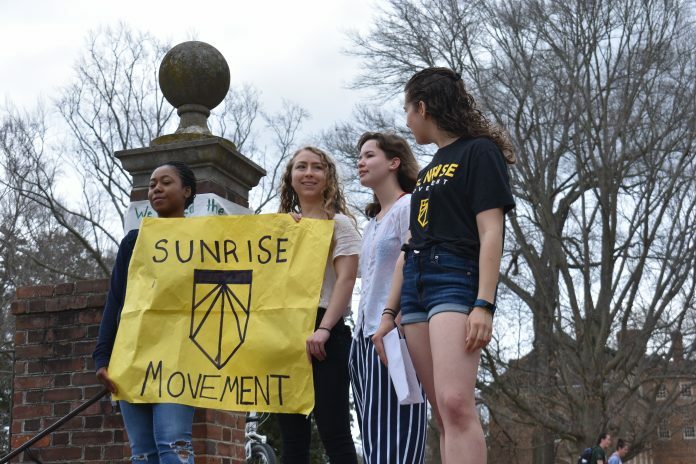 “Today we are taking action with students around the world who are also striking for their futures,” Sunrise Movement member Hannah Ferster ’19 said. After a crowd of roughly 40 students had gathered at the east end of the Sunken Garden, Ferster spoke from the top of the stairs. She explained that the Sunrise Movement is a youth movement aimed at stopping climate change and ending the fossil fuel industry’s influence in politics. Referencing an estimate from the United Nations, Ferster reminded the crowd that unless drastic changes take place, only 11 years remain before the worst effects of climate change are felt. “We are fighting for a future where we all have clean air and water, a stable climate and the economic stability to live fulfilling lives,” Ferster said. Ferster spoke about how she felt exploited by fossil fuel companies who were selling out her future and those of her community for a profit. She emphasized that low-income communities, indigenous communities and communities of color are disproportionately affected by climate change. According to Ferster, this crisis has become so urgent due to the lack of action taken by politicians, leaving the fight for change up to a younger generation. It is this generation who will have to face the consequences of the inaction of their political leaders. The US climate strike, led by students, has identified five main points that they think are essential to fight climate change. These include passing a Green New Deal, halting all fossil fuel infrastructure projects, mandating that all decisions by the government be tied to scientific research, declaring a national emergency on climate change and making climate change education compulsory from kindergarten through eighth grade. “Climate change should be a nonpartisan issue that is only directed by the best scientific knowledge available, but it hasn’t been this way in the past, and early education is the best way to ensure that these decisions are being made according to science and not politics,” Ferster said. In addition, the Williamsburg Sunrise Movement Hub outlined three demands that they have for the College in order to show bold leadership at the local level. These demands include the College’s commitment to 100 percent renewable energy on campus by 2030, the divestment of all stocks, bonds and investment funds from fossil fuel companies and a minimum wage of $15 for all campus employees. Ferster said that this last demand is important to climate change because lower-income communities are most affected by climate change, so it is essential that they have the financial resources to protect themselves from its effects. After Ferster spoke, YDSA member Colin Cochran ’21 talked about the human toll that climate change enforces across the globe and urged those present to hold wealthy executives and powerful political leaders accountable for their actions. He said that these influential figures use their wealth and power to stall action on climate change while profiting off of the fossil fuel industry. Cochran called for an immediate transition from fossil fuel-based economies, explaining that changes need to go beyond the individual level. He also called for the rejection of the eco-fascism that countries take part in when they continue to exploit the resources of the less fortunate while only protecting their own people from the effects of climate change. “We must reject this, and we must demand climate justice because predictions are that many more millions will be killed and perhaps billions displaced if nothing is done. In every life we lose to environmental destruction is a battle lost for all of us and it is an uncorrectable injustice. But we must not, we cannot, and we will not lose this fight.” Cochran said. Finally, AISA President Maggie Orozco ’21 spoke about the destructive nature of climate change, especially when it comes to indigenous communities. She also emphasized that this is an issue that affects everyone and that students at the College can and should take up a leadership role in fighting climate change and set an example for other universities. Isabel Agostino ’22 said she had been saving her permitted skips from her Friday discussion class and thought that this would be a perfect use of them. As a student pursuing an environmental policy track, Agostino said she was terrified of the current state of the climate.